This coming Saturday night, Britain’s BBC 4 will broadcast the final two episodes (installments 19 and 20) of that outstanding Danish TV crime thriller, The Killing. I must say, this series has taken the country by storm and stealth, even winning a mention in The Times’ “leader column” last weekend. Therefore, I don’t feel at all alone in admitting my personal obsession with the show. Detective Inspector Sarah Lund is looking forward to her last day with the Copenhagen Police Department. She is supposed to move to Sweden with her fiancé and transfer to the Swedish Police, but everything changes when a 19-year-old girl, Nanna Birk Larsen, is found raped and brutally murdered. Along with Detective Inspector Jan Meyer, Sarah is forced to head the investigation, as it soon becomes clear that she and Meyer are chasing a very intelligent and dangerous murderer. Local politician Troels Hartmann is in the middle of a hard election campaign to become the new mayor of Copenhagen when suddenly, evidence links him to the murderer. But is he really the murderer? At the same time, the girl’s family and friends struggle to cope with their loss. Due to a maddening workload, I haven’t been able to post much in The Rap Sheet for the last several weeks. But as a way to relieve stress, I’ve treated myself to The Killing (Danish title: Forbrydelsen, translated as “The Crime”) ever since it commenced showing on this side of the Atlantic back in January. For me, the series is something like a flat-screen equivalent of crack cocaine--highly addictive and guaranteed to chase away reality, at least for a short while. So, even though my family finds this latest TV addiction of mine annoying, I shall do whatever is necessary to see this weekend’s concluding episodes. 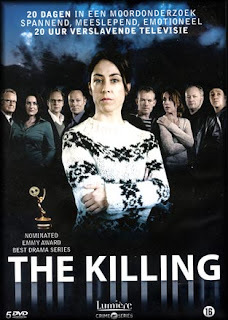 More and more residents of the UK have become avid fans of this program since its debut, thanks partly to unusual excitement expressed in press circles--and despite the fact that The Killing is being broadcast on BBC 4 in Danish, with English subtitles. This series offers a wildly labyrinthine plot, propelled by anxiety over what might happen next, with plenty of suspects, red herrings, political intrigue, heart-breaking performances ... Sheesh, after each episode, I feel as if I can’t take any more. Yet I keep coming back, because it appears that everyone and anyone might have been behind the murder of Nanna Birk Larsen, with each suspect appearing guilty and having his or her own dark motivations. I want to know, finally, who did it. Although The Killing ends its run in Britain this weekend, viewers who’ve missed seeing it can catch up with the equally subtitled DVD version. I’m always cautious with regard to U.S. remakes of television shows and movies, and I might yet be disappointed with what Sud and Company cook up. But one thing I’m glad of is that--as can be seen in the trailer embedded below--Enos’ Sarah Linden (an Americanization of “Sara Lund”) will wear the same “wooly-jumpers” that have featured so prominently in the version we’ve been enjoying in the UK, as worn by actress Sofie Gråbøl. Those Faroe Island sweaters have become something of a fashion statement hereabouts. Even before The Killing starts in the States, though, we can look forward to a continuation of the Danish version. Series II aired in Denmark in 2009, and Series III is currently in production, with an air-date in that same country of September 2012. If you want to learn more about why the crime-fiction-reading world seems to be revolving around Nordic and Scandinavian works lately, check out the BBC’s wonderful program on that very subject, which includes insights by UK critic Barry Forshaw. The show is archived here. READ MORE: “Why The Killing Is the Best Thing on Television--10 Reasons” and “The Killing Was a Killer Show,” by Robin Jarossi (Crime Time Preview); “Danmark--hvor det sker! Or ... Denmark--Where It’s At!” (The Guardian). Thanks so much for linking to the BBC program. I just watched it. It's very good. Will pass this on to others. My absolute favorite show is BREAKING BAD, but this sounds like one to add. Thanks for the tip. I already saw Lund 2.